Singapore has a strong appeal to attract overseas business owners, investors, and exporters to list Singapore as their network, base of production, or simply market. There is a big world of business that can be explored without stress and hassle in Singapore especially since it is a country with an extensive range of business policies, tax concessions, and even grants. To set up a business in Singapore is an easy, quick decision. Singapore is the right place for business, and has the right local people to make your wish to make a successful company come true. Also, the stabile political conditions of Singapore always create good times for business to grow aggressively! Employment Pass For foreign professionals, managers and executives. Candidates need to earn at least $3,300 a month and have acceptable qualifications. 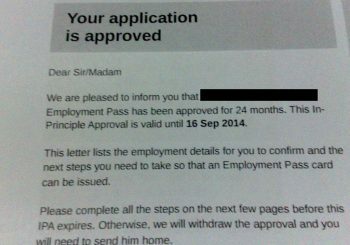 Personalised Employment Pass For high-earning existing Employment Pass holders or overseas foreign professionals. The PEP offers greater flexibility than an Employment Pass. Dependant Pass For family members of qualified Employment Pass and S Pass holders can come to Singapore on a Dependant’s Pass. Only legally married spouses and children under the age of twenty-one are eligible to apply. Please note that employment pass and S pass holders must earn a minimum of S$5,000/month in order to qualify bringing their dependants to Singapore. Letter of Consent (LOC) Letter of Consent Application is designed for eligible LTVP/LTVP+ holders married to a Singapore citizen or permanent resident, and Dependant’s Pass holders who wish to work in Singapore. The LOC expires at the same time as DP. Permanent Residence status gives numerous benefits to its holders including access to property, quality education or employment, healthcare services, and financial benefits like loans. According to the Enlistment Act, the sons of the holder must serve two years in military service and each year in Operationally Ready National Service. Singapore citizenship status gives numerous benefits to its holders including Singapore passport and better access to quality property, education or employment, healthcare services, and financial benefits. To attain this status, one must give up their previous nationality.